Jewel Quest is a new take on the classic-style matching game, where you need to discover hidden treasures and priceless artefacts. In Jewel Quest you have to explore the ancient ruins of Mayan civilization while discovering hidden treasures and priceless artefacts. As you venture deeper into the jungle, you will encounter increasingly difficult puzzles containing secret twists, cursed items, and buried artefacts. The classic match-3 puzzle returns with over 70 all new jewel boards. 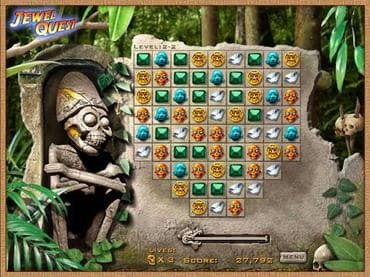 Jewel Quest is a fun puzzle adventure for the whole family. Download Jewel Quest free and earn the respect of your fellow archaeologists and collect oodles of treasure and jewels! If you have questions about Jewel Quest game, please contact us using this form.